This project gives you the opportunity to experience 31 different HP calculator models from the late 60's and 70's era. Where possible original sound effects were used for calculators, printers, plotter etc. 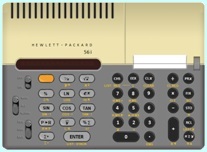 While pottering around the web some time ago I came across the HP-45 scientific calculator which was made by Hewlett Packard back in the 1970’s. Seeing it again fired up feelings of nostalgia and took me on a journey back to my school days when I used to own one of these so many years ago. Back in the day the HP-45 was one of the first in a new breed of pocket calculators which are referred to as the Classic Series. Calculators are pretty much taken for granted these days, cheap and plentiful, tossed back into the drawer after use and even for the technically inquisitive, hardly worth the look inside when all you see is a small black blob on a circuit board. There was a time when the calculator was a prized item and although not as fast as today’s variants, were much faster and more accurate than the well used slide rule and amazingly some mainframe computers as well. For the curious, even to this day, there are still interesting goodies inside to fire up a technical imagination. A few of the carry cases were nicely crafted items too. Some were made from real leather and others made from metal with a luxurious leatherette cover with a soft lining inside. There were also lockable accessory items to chain those expensive items to the desktop. Back in those school days we had to use paper, pencils, grey sandy erasers that loved to munch holes through your work notes, and awful logarithm books to help solve multiply and divide problems. Modern technology came to our maths class one day when we were presented with a pile of odd looking cardboard computer cards and given a simple problem to try and solve. Armed with a high tech paper-clip we poked through the pre-punched numbers imprinted on these cards causing a small snow storm of paper dots that scattered around the classroom. Well, not that bad, but the cards were soon gathered up by the teacher and mysteriously sent off to a university mainframe computer and I’m guessing now that its error routines went into overdrive as it tried to digest them. A few weeks passed and the results came back printed on a pile of folded perforated paper sheets, but sadly our paper clips were probably bent in the wrong shape and none of us were ready to join the computer age just yet. It was about that time when calculators began to creep into the classroom and like most I decided that I would like to own one too. Some I had seen at the time were big with a tiny eight digit display, had the basic four functions and maybe a square root key. I decided the one I wanted was the new HP-45 scientific calculator but it had a reduced price tag of around $240.00 and as my family was one of the usual battlers, the challenge was up to me to figure out how to get one. No small feat for a wee school lad in those days. 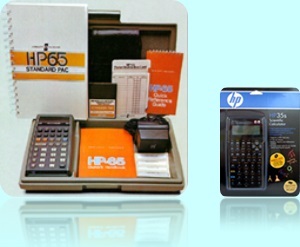 An example of the HP-65 delivery package compared to todays models. This series of calculators have held their value over the years with many still working today or have been restored back to working condition and kept as collector’s items. Having an early interest in electronics, after awhile I couldn’t resist and had to open up the calculator and see what was hiding inside. I didn’t understand much about the internals back then but hopefully here is a better albeit brief insight. The architecture of the Classic Series was similar although the HP-65 had the unique magnetic card reader. The circuitry was optimized for floating point operations and because silicon real estate was expensive back then, the data bus paths were serial not parallel as you might expect. This meant the circuitry and PCB design could be much simpler and therefore cheaper. Sections of data such as the exponent of a number could be intercepted in the serial bit stream and used individually for the computations. The 3 busses were the SYNC line, the Is line used for instructions, and the WS line used for gating the serial stream. 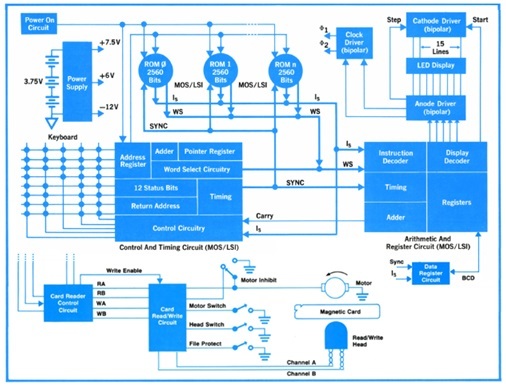 The chips used were MOS/LSI types and included multiple ROMs, an Arithmetic and Register Circuit (ARC), a Control and Timing Circuit (CTC), a two phase clock generator, LED anode cathode drivers and some models had a RAM storage chip having 56 bits per register. Low power consumption requirements soon meant that CMOS chips would be used, however at the time the extra gate required more silicon and the additional manufacturing processes added up to a higher cost. Negative Logic was used where 0V represented Logic 1 and 6V represented Logic 0. The Classic Series consumed about 500mW and the switching power supply transformed the 3.75V NiCad battery output to +6V, +7.5V and -12V. The batteries would generally last a day, unless left on all the time and once flat, they would require an overnight recharge. Internally, numerical data is made up of 14 digits in binary coded decimal (BCD) format giving a word size of 56 bits. Ten of the digits were allocated for the mantissa, one for the mantissa sign, two for the exponent and one for the exponent sign. The ARC executes instructions from the Is line and sends out display data to the LED anode driver and carry bit information to the CTC chip. It also incorporates the seven 56 bit working registers A to M which include the operational stack registers X, Y, Z and T. Not all of these registers could communicate with each other. For example the M register could only be accessed through the C register. The CTC controls the house keeping functions of the calculator including interrogating the keyboard, checking system status, synchronization and modifying instruction addresses. The anode driver was responsible for final decoding of the display data, driving the LED anodes, sending clock signals to the cathode driver and low power indication which lit all decimal points. The cathode driver is a 15 bit shift register for sequentially controlling the on / off state of each display digit. The ROM chips could hold 256 ten bit words using serial address in and serial data out. Three of these chips were used in the HP-35, shown below as round cans. More program memory was required in the other models so DIL packages were produced with four times the memory and were referred to as Quad ROMs. To save space in models like the HP-65 and HP-80, all the logic chips, with the exception of the ROMs were placed on a hybrid chip carrier inside a rectangular metal can. To run the internals, a series LC oscillator is used to generate a frequency of about 800KHz. This signal was divided down to a 2 phase 200KHz system clock which was the maximum allowed for the chips and gave a CPU word cycle time of 286uS. LC oscillators are not that accurate, so a more stable crystal oscillator circuit was used in the HP-55 because it had a usable timer function. The HP-45 had a non documented timer but could be accessed by pressing RCL and then the CHS, 7 and 8 keys simultaneously. Word got around that you could modify the underside of the HP-45 ENTER key and then the timer could be activated more easily by pressing RCL then ENTER. It was also possible to install a 784KHz crystal to make the timer more accurate. The timers were implemented by a fixed 35 instruction code loop which set the time delay for a 100th second counter. (35 x 286uS = 10mS, x 100 = 1 second). Because there were no software interrupts, you either had a calculator or a timer. These delays will compound themselves when executing complex algorithms from a running program, and the calculators would appear to ‘hang’ for sometimes quite long periods. Registers A and B are used both for holding display data and for general software tasks, so while programs were running and with some calculations, the display shows the jumble of data going through these registers to give some user feedback while the calculator is at work. The following original demonstration shows the length of time it took someone using a slide rule and the new HP-35 calculator to solve the great circle distance between San Francisco and Miami. Breathtakingly fast back in the day no doubt, and many of the engineers quickly replaced the slide rules in their top pockets with these new calculators. In fact the HP-35 quickly became a sought after item far exceeding initial market expectations with over 300,000 units being delivered in the 3 years following introduction. However, going unnoticed until after production began, a problem occurred when calculating the natural log of 2.02 using the ln key. Reversing the process with the eX key gave an answer of 2 rather than the correct 2.02. This bug was discovered after many units were sold and while it could have been ignored, all affected owners were notified and offered replacements. Interestingly some owners decided not to take up the offer and some of those buggy calculators are still floating around today as collector’s items. All the Classic calculators had a 15 digit display. The decimal point position was not part of the 14 digit numerical data. Instead, its position was decoded by the anode driver and occupied one whole digit on the display. Its true position could still be seen even if all decimal points were lit during a low power condition. Register A held the BCD digits for the display while register B was used as a mask register. Nibbles in register B were decoded by the anode driver such that 9 = Digit Off, 0 = Digit On, and 2 = Decimal Point On. On detecting the decimal point, the anode driver would display it in the next digit and then add an extra clock cycle to display the following number. Numbers were formatted in 10’s complement notation with 9’s in the sign digits indicating negative numbers and were decoded by the anode driver to display the negative sign. An interesting feature of the multiplexed LED display was its brightness and was achieved by using small inductors to dump their stored charge into each LED segment. Timing was critical so that the charge would not bleed into adjacent displays causing them to be partially lit. The inductors had a charge time of 2.5uS and the discharge time through the LED segment was about 5uS and gave an average single LED current of about 0.73mA. The Status register is made up of 12 bits and can be used as software flags but some bits are connected directly to hardware logic. An example is Status bit  which is set to 1 when a key is pressed and back to 0 when it is released. 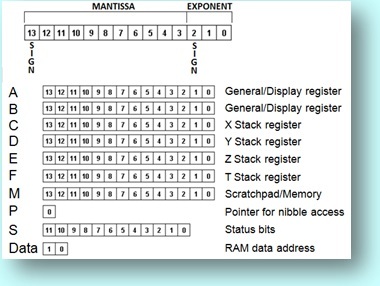 Register C nibbles 12 and 11 were used to load the Data register with a RAM address from the instruction [c -> data address]. The C register could then be loaded with a new number which could be stored in RAM with the instruction [c -> data]. RAM was transferred back into the C register with the instruction [data -> c]. Unique key press values are generated from the CTC scanning process. For example the ENTER key when pressed returns a value of 62. (60 if modified as mentioned above.) The actual key values are transferred to the program counter by using the instruction [keys -> rom address], therefore each key press provides an index to a simple but efficient jump table. In this part of the HP-45 code listing from ROM 4 you can see that the two entry points for the ENTER key (60 and 62) do essentially the same thing, which in this case was after the Shift key was pressed and executes microcode to set the [Deg] mode of operation. There was a lot of effort put into the keyboard operation to make it user friendly even down to the key spacing and colouring. Each key had an “oil canning” roll forward operation which gave them a high quality positive feel and were double injection moulded for longevity and even after 40 years they still work. After purchasing the calculator I soon realised that the keyboard was missing the [=] key and confused me for a while. I had never heard of RPN previously, but it was well demonstrated in the manual and the concept was easy to learn. I have to say even to this day, I still prefer it over conventional calculator operation. This method is referred to postfix notation and became known as Reverse Polish Notation or RPN in honour of Lukasiewicz. Implementing this concept in a computer environment requires an arrangement in memory called a stack. The Classic Series have 4 levels of stack named X, Y, Z and T and these appear in registers C, D, E and F. Keying in number (a) initially goes into the X register and pushes the other values in the stack up by one level with the value in T being lost. Number (b) is then entered followed by the operator [add]. This causes the values in X and Y to be added with the result being placed back into X. The upper stack levels all drop down by one with the T value being duplicated into Z.
Stack manipulation in the calculators is software driven and uses instructions like [c -> stack] which pushes the stack up 1 level and copies the X register into Y. As an example, it is used in code when the ENTER key is pressed. The user can also manipulate the stack by rolling it up or down and swapping the X and Y registers from the keyboard. During the design phase, building the circuits discretely for testing was considered but would not be practical. Fortunately there was some computing power available which could simulate designs down to gate level, although the data input was on punched cards, (presumably better paper clips than mine) and the output was printed on paper and had to be evaluated. 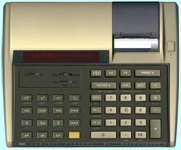 The HP-35 actually had numerical algorithms that exceeded the precision of some mainframe computers at the time and writing those calculator algorithms offered some interesting challenges for the engineers. Maintaining the accuracy of the various calculator functions was difficult to achieve especially when rounding errors compound themselves. Calculating SIN(x) for example required a divide, multiply, subtract, two more divides another multiply, an addition and a square root, with each process adding to rounding errors creating an undesirable outcome. The code therefore had to be written using various mathematical techniques and the engineers did a remarkable job getting around these problems given the limited hardware available. All code for these calculators was listed in OCTAL format as shown in the following instruction listing example at address @54 (44dec). The CPU code is binary with dots representing 0’s. Here’s a small taste of one of the many problems the engineers would have been faced with. Some calculator models required more than 8 ROMs so an extra hardware bit was added to enable addressing for 2 groups of 8 ROMs. New instructions were introduced and were called [delayed select group] and [delayed select rom]. They were “delayed” because they only preset the ROM or group addressing bits and had no effect until a jump or subroutine instruction was executed. That way you could select a group and a ROM in that group prior to the actual program counter change. As a bonus they also allowed jumps to random memory addresses which simplified the programmer’s job quite a bit. The HP-65 and HP-67 were unique in that they incorporated a miniature magnetic card read/write mechanism and with 100 words of usable program memory (224 for the HP-67) they were formidable devices in thier day. Mind you, the earlier HP-9100A/B models also had program card capabillity, but a box full of HP-67s could fit in the case of one of these beauties.The program elements were just copies of the key codes and each occupied 6 bits in memory, (8 bits for the HP-67). In some cases two or three keys could be saved as one code and therefore conserve expensive memory space. Merging key codes like this was a new concept back then and in the HP-65, they were allocated to 25 commonly used key combinations such as STO 1, which stores the displayed number into memory 1. 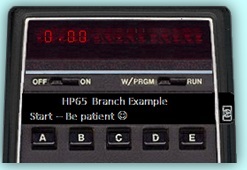 The HP-67 had many more merged codes available. The HP-65 program memory was essentially a 600 bit serial buffer. It had provision for a fixed top of memory marker, plus a program pointer and a subroutine pointer which were both free to circulate inside the buffer. The single subroutine pointer allowed for one level of subroutine only. 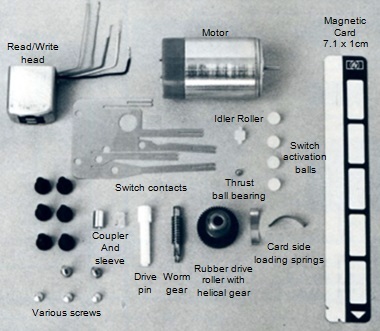 The magnetic card read/write mechanism posed many mechanical and electrical design difficulties such as card alignment, low battery, temperature problems and greasy cards to name but a few. They were eventually overcome and the result was a calculator that was only slightly deeper in size than the others in the Classic Series. It was impressive engineering for the day and without modern CAD systems some cases were moulded in clear plastic to see how things would fit inside. The HP-67 used 32 x 56 bit RAM registers to store the program data. The memory cards for this calculator could also store data memory and if required the programs and data could be stored on 2 cards. The memory cards stored the program data, a header and checksum and were written onto the magnetic media at 300 bits per inch. It took about 2 1/2 seconds for the card to move over the head for the read/write process. Once stored in the calculator memory, individual program functions were generally activated from the A to E or R/S keys. If desired, you could use a marker pen to write program details onto the face of the card which you could slide into a slot above the keyboard for reference. Many programs were available for purchase and you could write and share your own which was quite popular. The emulator program allows you to use these calculators either by themselves on screen or open them up to simulate, set break points, modify, compile and experiment with all the operating code and registers. All design files are provided to create a real calculator that can be built from cheap and easy to get components and is based on the PIC18F47K40 microcontroller. 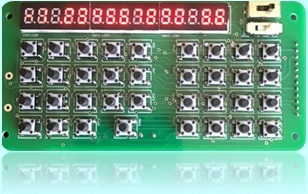 The one circuit emulates the original code and functionallity for 22 calculator models which can be selected by using an inbuilt menu directly from the keyboard. It also includes the slide switches for functions like the Run-PGM-Timer function used on the HP-55 and the Run-W/PGM functions for the HP-65 and HP-67. Printable keyboard overlays for each calculator are also available. The original low power display modes are also fully working. The PC emulator program can communicate with it via the USB port and lets you change calculator models, upgrade the driver software, and transfer a large range of programs for the HP-65 and HP-67 memory cards and programs for other programmable models like the HP-25. The project was put together using freely available documentation from the web, however some microcode information proved to be unreliable or totally unavailable so in these cases a "best guess" approach was used to fill in the blanks and do the repairs, however all calculators operate as presented in thier respective owner handbooks and documentation. For example, the microcode for the HP-10 will probably never become available as it is embedded inside a single chip, so the microcode for this model was written completely from scratch using the owners manual as a guide and assembled using the emulator described here. The software was developed in a 32 bit Windows 7 environment, but seems to work ok on XP, Win 8 and Win 10. The MultiCalc download includes the PC emulator, Help file, PIC HEX file, schematics, PCB design files, and key overlays. After installation, see the help file (PDF) for setup information. This file also includes construction details on how to build the real working calculator. The other downloads are modules that implement the respective calculator. All files are in zipped format. Download MultiCalc.zip and unzip into a directory of your choice. All calculator modules (except stand alone applications) must be unzipped into this directory or they won't work. The owner handbooks for some calculators and some of the quick reference guides and patent documents are also available. This is a totally new version with the MuiltCalc based on a PIC 18F47K40 chip. Unfortunately due to the complex code changes, it was not possible to make it compatable with the earlier hardware calculator based on the PIC16F1519. If you want to keep using the original version and also want this one, download these newer files to a new directory. Note: Please make sure you have the latest calculator module if it has been updated or it might not work with the current MultiCalc files. Some manuals in the download are a bit grainy. If you would like to get some better ones and also see a lot of interesting HP calculator information, take a leisurley visit to the HP Museum. Formatted programs from the HP-25 Applications Program Manual, 55 in all, compatable with the Emulator and MultiCalc. A collection of 63 HP-25 programs from the PPC Journal, compatable with the Emulator and MultiCalc and in *.txt format. Some HP67 Programs from Dave Eaton. The original microcode for all calculators (HP-10 is my code) is stored inside the PIC chip and each model is instantly selectable from the menu accessed from the keyboard. Works on 3xAAA batteries, 3.7V LiPo, and can be powered via the USB port. The calculator can store and recall up to 8 blocks of 51 programs for the HP65 and HP67 plus a total of 8 blocks of 32 programs for the other programmable models. Continuous memory supported for the HP-19c, HP-25c, HP-29c, HP33c, HP-34c and HP-38c. Battery monitoring and gives original looking low battery display when activated. USB interface built in, but requires a generic USB cable for connection to a PC. The HP-10, HP-19c, HP-46, HP-91 and HP-97 all have a printer, so the PIC calculator can transfer all the microcode printer instructions to the PC (if connected to the USB port) and it will display the printer output from these models. You can also print a hard copy to paper if desired. All printouts are in the original thermal or mechanical printer style. Details included in MultiCalc download. The PCB design has some surface mount parts.